Everyone knows that hardwood flooring is susceptible to water, but many homeowners are unaware of another common threat: light. That's right! Every type of hardwood flooring is photosensitive to some degree, and without the proper preparation and maintenance your floors can lose their luster over time. Luckily for you, we have four helpful hardwood flooring maintenance tips for protecting your floors from damaging UV exposure. You're welcome! The best defense against UV exposure is understanding exactly what it is. Hardwood photosensitivity is the reaction that hardwood flooring has to UV radiation. Exposure to UV can cause wood colors to fade, and in some cases can dramatically change the appearance of your flooring. By understanding what light can do to your floors, you're well on your way to protecting them from harmful rays. Unfortunately, there is no surefire way of protecting your floors from UV exposure. There are, however, many ways you can minimize their exposure to it. One way is to control light exposure using heavy curtains or blinds. These block out harmful UV rays during peak daytime hours. Since many people are out of their homes during the day, drawing the blinds is a perfectly acceptable way of preventing UV damage. Keep in mind that while minimizing light exposure can slow color fading, it won't stop it entirely. Another way of minimizing UV exposure is rearranging your furnishings often. Hardwood floors will often show phantom furniture "shadows" - outlines on the floor where an armoire or couch has sat for years. Simply moving your furniture every so often will equalize the UV exposure and slow the fading process. Some homeowners know about the effects UV exposure can have on their new hardwood floors and plan for it in advance. If you choose this route, talk with a hardwood professional about what kind of color change you should expect. Armed with this information, you can periodically change your room's decor to match the new floor color. You can even make design choices that not only fit the current floor color, but the color you know the floor will become. Unless you have installed the flooring in a windowless room, there is no way to avoid UV exposure. You can, however, minimize the amount of light your new floors receive, balance the amount of light each part of your floor gets, and make design choices based on your floor's new faded color. Remember, color change is a natural occurrence; you can delay the process, but you can't stop it entirely. Of all the flooring materials on the market, hardwood is widely acknowledged as the healthiest option for you and your family. Carpet can trap allergens and parasites, vinyl can attract mold, and tile can encourage water pooling. Hardwood flooring, on the other hand, is naturally resistant to mold and decay and has no fibers to trap dirt and common allergens. The following are the four main reasons why hardwood flooring is a healthier choice for your home flooring needs. Carpets and rugs are made of thousands of individual fibers that can attract and trap dust mites, dirt, and dander. If you suffer from allergies you may notice your symptoms worsen after installing carpet. You can lessen this by steam cleaning and vacuuming, of course, but many allergy-stricken homeowners simply don't have the time or energy to perform the carpet maintenance necessary to keep an allergy-free home. Hardwood flooring is a simple, beautiful solution to common household allergy problems. Dirt and dander is actually visible, meaning you know exactly what may be causing your allergy attacks and what you need to do to alleviate them. We all know the dangers of chemicals and toxins in our air, water, and food supplies, but how many of us think about all the toxic materials we track into our homes everyday? Oil, animal waste, garbage - these are just a few of the nasty things that can get on our shoes and brought into our homes. Carpet flooring can trap and soak up these toxins and, over time, become a serious health risk to you and your family. Hardwood flooring doesn't do this. Carpet fibers can also be home to fleas, ticks, bed bugs, mites, and other parasites and insects. These pests aren't only a nuisance to your pets - they can also bite you, your family members, and your house guests. Once you get an infestation of carpet parasites, getting rid of them can be a major hassle and can sometimes require calling a professional exterminator. Hardwood flooring gives parasites and pests no place to hide or thrive. Unlike vinyl, dense hardwood flooring is naturally resistant to mold and other water-related decay. Certain types of synthetic flooring material can be very susceptible to mold growth. Exposure to mold can cause many health problems, including asthma, eye or skin irritation, and even lung infections. Hardwood flooring carries very low risk of mold growth and is a much healthier floor covering option. To learn more about hardwood flooring and its health benefits, visit www.WoodMonsters.com and chat with one of our online flooring professionals. Wood Monsters is proud to feature dozens of high-quality hardwood flooring products, but with so many options, picking the right species and style for your flooring project can be overwhelming. That's why we've started this blog series - to showcase some of the most popular and highest-quality hardwood flooring products we carry and offer enough information to allow you to make an informed decision. This week we're featuring one of our most popular exotic hardwood flooring lines: solid prefinished African Walnut. Enjoy! 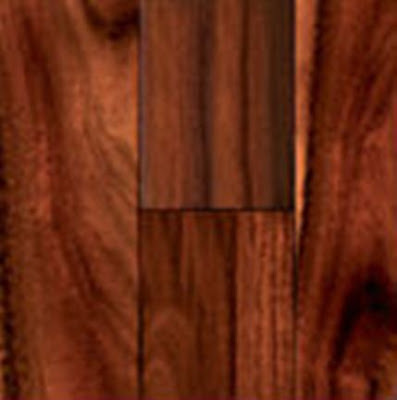 Wood Monsters carries the Elegance line of solid prefinished African Walnut hardwood flooring. This narrow, solid smooth flooring line has a distinguished look perfect for dining rooms, living rooms, libraries, halls, and studies. The wood's color is a dark brown and it is nearly uniform in texture, which adds to its versatility. The dark tones, high luster, and uniform look make it compatible with nearly any design scheme. African Walnut is not just a pretty face - it's also one of the most durable species of hardwood flooring you can find. It is naturally resistant to decay, has high hardness and density ratings, and has good dimensional stability. If you're looking for an attractive hardwood flooring option that will last for decades, look no further than solid prefinished African Walnut. Questions about this species? Contact Wood Monsters today to find out more about solid prefinished African Walnut hardwood flooring. Hardwood Flooring Mechanical Properties - What Do They Mean? There are a number of mechanical properties industry insiders use to describe and qualify different species of hardwood flooring. This vocabulary is used to talk about a wood's strength, density, its tendency to shrink or swell, and other hardwood features. But if you are just starting your search for new hardwood floors you probably aren't familiar with these terms, and you probably don't know why they're so important. 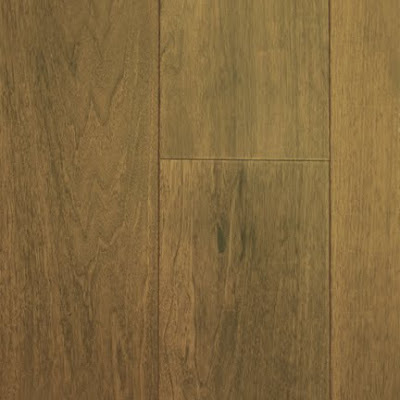 The following are the six most commonly used hardwood flooring properties, what they refer to, and why knowing what they mean can help you pick the perfect flooring material for your home or office. Officially called Janka hardness, this property measures how resistant a specific species is to indentation. It is determined by measuring the pounds of force required to embed a small ball (about .444" in diameter) into the wood a distance of half its diameter (.222"). The larger the number, the harder the wood. Most exotic hardwoods have higher Janka hardness ratings and are very great for high-traffic areas or in rooms that hold heavy furnishings, such as pianos and entertainment centers. Also called strength, a wood's MOR refers to the wood's load-bearing capacity - or, the amount of force that is required to break the wood. It is measured in pounds-per-square-inch (psi), and, like Janka hardness, the higher the number the stronger the wood. It is another property that is important to know if you plan on using the flooring in a high-traffic area or a room with heavy furnishings. MOE is also called stiffness and is a measurement of the wood's resistance to bending. It is measured in pounds-per-square-inch and is expressed in exponential terms - for instance, the MOE of Douglas Fir is 1,950,000 psi, or, 1,950 1000 psi. This property is a good indicator of how likely your floors will be to buckle. The higher the MOE, the less likely they'll warp or buckle. Density is measured in KG per cubic meter (KG/m3) and essentially is the measurement of you much wood is actually packed into a cubic meter. Hardwood species with higher densities are heavier and harder, which can be great for high traffic areas or exterior projects. Hardwood flooring with high density is also more resistant to water and boring insects, making it a great choice for kitchens, bathrooms, and other high moisture rooms of the house. This mechanical property measures how likely the species will be to shrink during the drying process. It applies to the width of the board and is expressed as a percentage. The lower the percentage, the less likely the wood will shrink, reducing the amount of warping and buckling you'll experience. Like tangential shrinkage, radial shrinkage measures how likely the wood will shrink though the thickness of the board. It is also expressed as a percentage and, when considered with the wood's tangential shrinkage, tells you how dimensionally stable a floor will be. If the two numbers are close together, the wood is more stable and is less likely to warp or buckle. The hardwood flooring professionals at Wood Monsters are experts in hardwood flooring mechanical properties. Contact us today to learn more. The mechanical properties of hardwood flooring are important to know before buying. Hardwood flooring has been the most popular floor covering material in American homes for hundreds of years, and for good reasons. It is durable, versatile, attractive, and a renewable resource. But there are a few important things you should consider before buying hardwood flooring: your budget, your style, the room use, and the importance of proper installation. The following is more detailed information about each of these four considerations. Enjoy! In today's down economy, people are more focused on their budget than ever before. We all want to get the best quality products for the best prices. We also want to have a number of choices to choose from. Luckily, hardwood flooring comes in a number of different price ranges. There are certainly specific species of wood that tend to be more expensive, but hardwood flooring prices can also vary between different retail stores based on selection and availability. Hardwood flooring is one of the most versatile home decorating materials you can buy. Its main features - color, texture, shape, grain pattern, and stain - can be combined into hundreds of different styles that fit almost any home decor imaginable. It's important to pick a style of hardwood flooring that matches your current design scheme, but also one versatile enough to fit a different decor should you remodel in the future. It's very important to consider the use of the room in which you'll be installing hardwood flooring. Rooms that are below ground level are only suitable for floating or engineered hardwood flooring products due to the increased risk of moisture issues. This is the same for bathrooms and laundry rooms. For high-traffic rooms such as hallways or rec rooms, it's a good idea to use a species with a neutral color - a lot of use can show in the finish of darker or lighter colors. Without proper acclimation and installation, even the highest quality hardwood flooring products can warp, bend, and buckle over time. The National Wood Flooring Association's Installation Guidelines are the standards for hardwood flooring installation in the U.S. Make sure you choose an installer that closely adheres to these guidelines.